The socks of Wichita no longer have a young black cat to carry them to food. 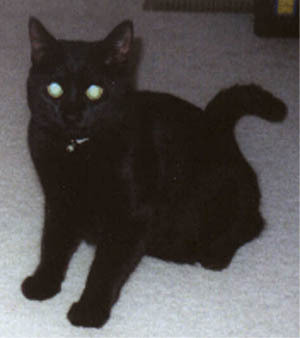 Steinbeck went to the Rainbow Bridge on July 12, 2000. Steinbeck was part of my daughter Paula's family. Paula, her husband Joey, her daughters Ashlee & Danielle, her elderly cat Tomo, and ferrets Holly & Molly, and all the household socks miss the big guy. Steinbeck was a little over a year old when a sudden respiratory illness was diagnosed as feline leukemia. He was helped to the Rainbow Bridge when nothing more could be done for him. His sister Bocanada went to the Bridge four months earlier.